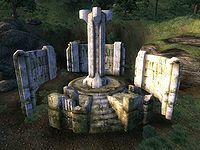 Malada is a medium-sized Ayleid ruin far east of Bravil containing undead, monsters and animals (quest-related). It contains two zones: Malada and Malada Aldmerisel. Malada is described in the book Cleansing of the Fane, which also reveals that the Ayleid word "Malada" translates to "High Fane". 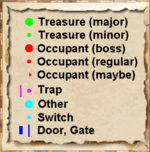 Until the related quest is active, you can only get up to a locked stone door (G) in the first zone, which requires a key. Just west of Malada is a small unmarked campsite, consisting of a campfire, a locked minor loot chest, and some bottles of ale. This camp is used as part of the Nothing You Can Possess quest. 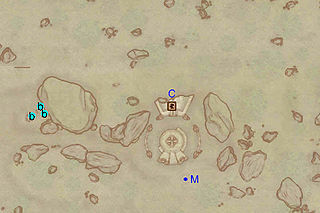 This location's map marker (M on map) is named Malada (editor name MaladaMapMarker). The entrance door is N of the marker, 100 feet away. You enter this zone from door Out. Two doors, C and D, lead to Malada Aldmerisel but the former is on a higher level than the rest of the zone and can be used a fast-track from the second zone. In some cases, this level might prove challenging since you might wind up fighting against several enemies at the same time. This may be the case in the first room, where, other than 0-3 enemies, three Welkynd Stones are located. Just outside is an intersect: left leads to an overhang with an enemy guarding a minor loot chest while by heading straight you arrive in a second room. Whichever way you go, you will probably attract the attention of the enemies found in the other room. 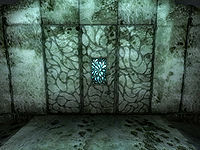 The next room can be quite a nuisance as you might find yourself fighting with up to six enemies. However, if you don't open the two gates nearby, you may stop some of the enemies and might be able to finish them off by summoning a creature on the other side of the gate to fight them. Also in this room are the remaining three Welkynd Stones of this zone. The next room is also quite tricky: two Dark Welkynd Stones (T) are conveniently located in the middle of a gas-filled room and will continue shooting at you. You will find yourself on a balcony overlooking the above-mentioned room. Be careful when fighting the enemy next to gate on the other side because the traps will continuously fire at you. The room itself contains nothing but a minor loot chest. The next room is also uneventful if you haven't started the related quest. 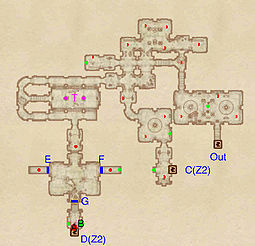 If you have, unlocking the Crumbling Wall at G with its key and retrieving the Carving will also open the two hidden doors at E and F. This will unleash two enemies and the boss-level undead (A). The latter, however may get stuck behind the rubble of the crumbling wall, and may therefore be dealt with separately. 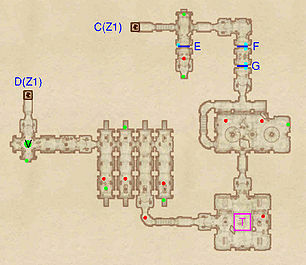 Before leaving to Malada Aldmerisel through door D be sure to loot the Boss Chest at B. 6 Welkynd Stones. Three are found in the first room (two on pedestals and one on the altar next to the Ayleid Cask) and three are found on pedestals in the northernmost room. 2 Dark Welkynd Stone traps are at location T on map. In addition, there are three invisible Gas Traps in the same room (including one on the stairwell), causing additional damage each time you walk through them. 2 Hidden Doors at E and F. These doors automatically open when the wall at G collapses, releasing the undead from their alcoves. The undead behind the hidden doors will always detect your character, even if the doors are closed, causing attack music to be played; sometimes the undead will teleport to your location after you go through a door into another zone. In the first room when entering from door D you will find the ruin's only Varla Stone (V). Unlike many others, this one doesn't have a cage that needs activating and it can be easily retrieved from its pedestal. The rest of the zone is pretty uneventful; simply weave your way through the following corridors, battling the enemies you encounter, until you arrive at gate G. Along the way, be careful to avoid the Ceiling Spike Trap (T) in the middle of the third room. To continue you will have to open both gates, G and F, by pressing the push blocks in front of them (cyan dots on map). After activating gate E in the same manner you will gain access to a minor loot chest. The enemy guarding it can be easily disposed of by firing ranged attacks or spells at it through the hole in the gate. Door C nearby will provide a fast-track to Malada.